Welcome to Buxton Cottage – The antithesis of modern day Hatteras Island. 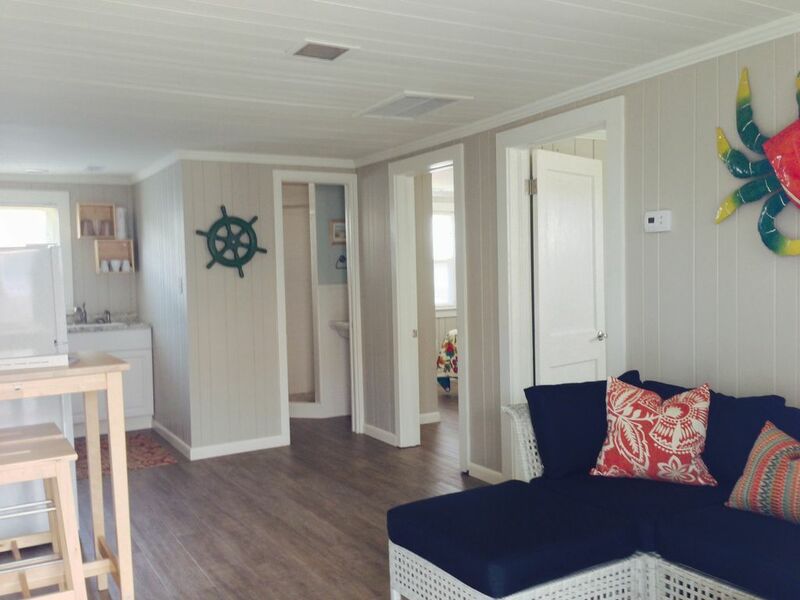 Come enjoy this 1950’s beach cottage fully renovated with all the modern amenities. This two bedroom, one bath getaway will cater to all your needs. Relax at the heart of the island. Buxton is centrally located between all of the best spots to kite board, wind surf, fish, beach access, surf, paddleboard, walk, hike, and bike. Just few minute's drive to the Cape Hatteras Lighthouse and beaches. You can walk to the Lighthouse beaches, and restaurants. Everything is within walking or biking distance. Just 1.8 miles from one of the premier kiteboarding locations, Kite Point. Buxton Cottage is 10 lots in from the Atlantic Ocean. Walk to the ocean and enjoy your morning cup of coffee while watching the sunrise... Then enjoy 6.8 miles down winders from Kite Point to North Avon pull out. Or even further if you’d like! We are sure this beach cottage will meet all your getaway needs! This is triplex building and The Maiden is located upstairs with a flight of stairs to the front door. The Maiden has two bedrooms, one bath, kitchen fully equipped, TV, internet, Wi-Fi, all linens are provided (4 bath towels and each bed has 1 set of sheets), complimentary items such as one roll of toilet paper, coffee filters and trash bags. Puzzles, cards. Parking and outside seating on the balcony. If we can help you with any local information while staying at Buxton Cottage please ask. We are more than happy to give you the local scoop on what's good! Provided for your convenience - 4 bath towels, 2 hand towels, 4 washcloths and 1 shower mat. 1 roll of toilet paper. Oceanside - 10 lots in from the Ocean - just a 2min walk to the beach! Private Parking (maximum 2 vehicles). Please - no parking in the side yard and backyard. Newly renovated with all new appliances. Shared balcony with chairs for sitting outside enjoying the ocean breeze. NOTE: This unit is located up a flight of stairs with a balcony. 32" TCL Flatscreen TV with Netflix / Roku; FREE WiFi; Shared covered deck with 2 Chairs and Side Table; Private parking for 2 vehicles; BONUS + Spacious Backyard with 4 "Tie-Down" Kite Drying Stations. NEW: Outdoor shower with sink for rinsing after being at the beach all day!! Staying in Buxton was a last minute decision for my husband and I and we’re glad we made it! We loved this quaint cottage that’s only a few steps from the beach. The sunrise was gorgeous both mornings and the shell picking was good. :) We felt our dining experience was mediocre however, the oysters at Diamond Shoals were fantastic! We cut or trip a day short because of Hurricane Michael as the locals said the road would flood out and we might have troubles getting out. All and all we’d love to come back and stay a little longer next time. Thanks for having us! The cottage was very nice, well maintained, and the kitchen area had enough accommodations. The view and location to the beach was fantastic. Our one issue was with bath towels, face and hand towels. There was one set and no linen services throughout our stay. Our options were to find a laundromat or purchase our own towels. Who wants to do laundry during a short extended weekend vacation! We were not asking expecting daily cleaning services, but a fresh set of towels at least once would have been great. Our overall stay was fantastic. Such a clean and simple property. We enjoyed ourselves immensely. Clean and peaceful place. Beach was beautiful and so clean. Plenty of places to eat near by as well as shops. I would totally recommend this property. Adequate. Walls are very thin and could hear neighbors like they were in room with us. Enjoyed stay but will find better accommodations next time. Kitchen was sparsely populated. Beds were not firm and wound up with backache. Home Away agent and her manager were excellent. The Maiden is a lovely vacation cottage. It is clean. The kitchen has everything you need to cook meals. We enjoyed many meals sitting out on the deck. The beds are comfortable. The outside shower is fantastic after a day at the beach. The walk to the beach is just to the end of the road... short and sweet! Thank you Linda for sharing your home with our family. Cottage at Buxton just 10 lots in from the ocean. Only 1.8 miles from one of the premier kiteboarding locations, Kite Point. Buxton Cottage is 10 lots in from the Atlantic Ocean. Drive or walk a quarter mile to light house. Enjoy 6.8 miles down winders from Kite Point to North Avon pull out. Or even further if you’d like! We are sure at this beach cottage will meet all your getaway needs! Rates are subject to change until reservation is confirmed and rental agreement is signed and returned.